A son of Mā’ilikūkahi (who ruled about the time Columbus crossed the Atlantic) was Kalona-nui, who in turn had a son called Kalamakua. Kalamakua is said to have been responsible for developing large taro gardens in what was once a vast area of wet-taro cultivation on Oʻahu: the Waikiki-Kapahulu-Mōʻiliʻili-Mānoa area. The early Hawaiian settlers gradually transformed the marsh above Waikīkī Beach into hundreds of taro fields, fish ponds and gardens. For centuries, springs, taro lo‘i, rice paddies, fruit and vegetable patches, duck ponds and fishing areas were a valuable means of subsistence for native Hawaiians and others. Formerly the home of Hawaiian royalty, including King Kamehameha, Waikīkī, meaning “spouting waters,” once covered a much broader area than it does today. The ahupuaʻa, or ancient land division, of Waikīkī actually covered the area extending from Kou (the old name for Honolulu) to Maunalua (now referred to as Hawai’i Kai). Waikīkī’s marshland, the boundaries of which changed seasonally, once covered about 2,000-acres (about four times the size of Waikīkī today) before the marshes were drained. During the first decade of the 20th-century, the US War Department acquired more than 70-acres in the Kālia portion of Waikīkī for the establishment of a military reservation called Fort DeRussy. They drained and filled the area, so they could build on it. Thus, the Army began the transformation of Waikīkī from wetlands to solid ground. In the early-1900s, Lucius Pinkham, then President of the Territorial Board of Health and later Governor, developed the idea of constructing a drainage canal to drain the wetlands, which he considered “unsanitary.” This called for the construction of a canal to reclaim the marshland. 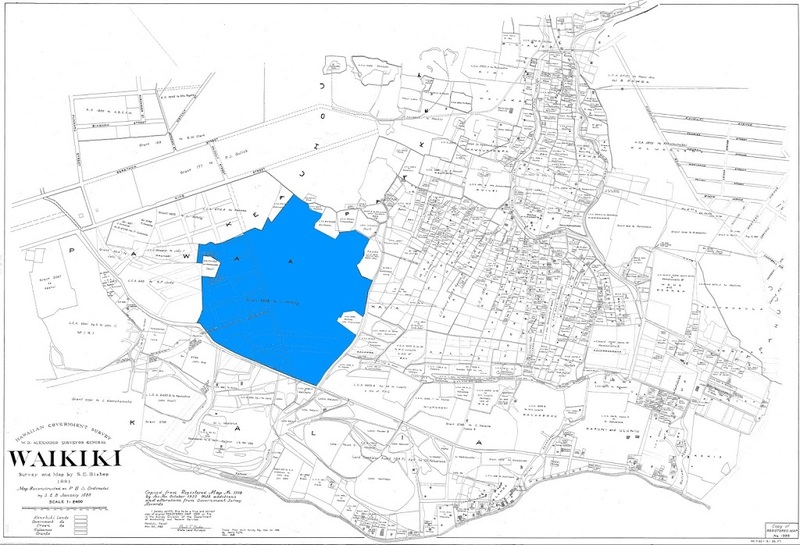 The Waikīkī Reclamation District was identified as the approximate 800-acres from King and McCully Streets to Kapahulu Street, near Campbell Avenue down to Kapiʻolani Park and Kalākaua Avenue on the makai side (1921-1928.) The dredge material not only filled in the makai Waikīkī wetlands, it was also used to fill in the McKinley High School site. 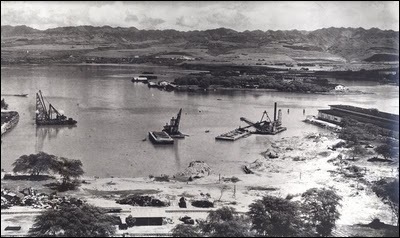 The initial planning called for the extension of the Ala Wai Canal past its present terminus and excavate along Makee Island in Kapiʻolani Park, connecting the Canal with the ocean on the Lēʻahi side of the project. However, funds ran short and this extension was contemplated “at some later date, when funds are made available”; however, that never occurred. By 1924, the dredging of the Ala Wai Canal and filling of the wetlands stopped the flows of the Pi‘inaio, ‘Āpuakēhau and Kuekaunahi streams running from the Makiki, Mānoa, and Pālolo valleys to and through Waikīkī. Walter F. Dillingham’s Hawaiian Dredging Company dredged the canal and sold the material he had dredged to create the canal to build up the newly created land. The canal is still routinely dredged, most recently in 2003. During the course of the Ala Wai Canal’s initial construction, the banana patches and ponds between the canal and the mauka side of Kalākaua Avenue were filled and the present grid of streets was laid out. These newly created land tracts spurred a rush to development. 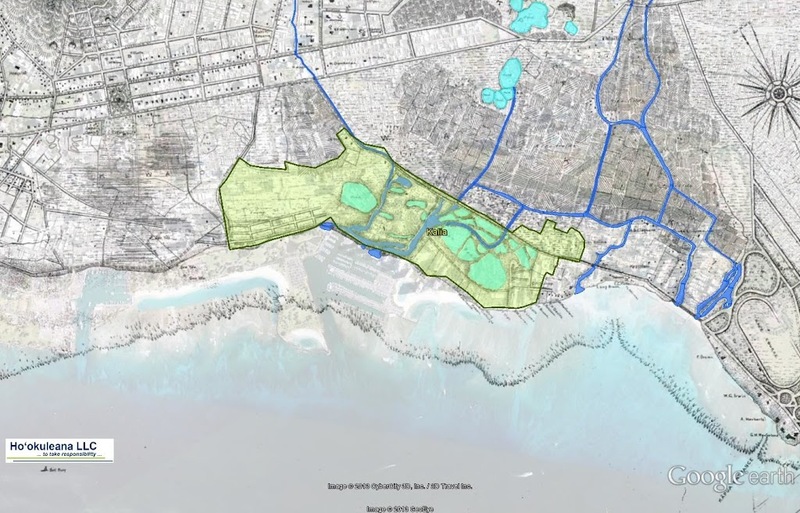 With construction of the Ala Wai Canal, 625-acres of wetland were drained and filled and runoff was diverted away from Waikīkī beach. The completion of the Ala Wai Canal not only gave impetus to the development of Waikīkī as Hawai‘i’s primary visitor destination, but also expanded the district’s potential for residential use. During the period 1913-1927, the demand for housing in Honolulu grew along with the city’s population. Waikīkī helped satisfy this demand; the large kamaʻāina landholdings virtually disappeared and the area started to be subdivided. From an economic point of view, without the Ala Wai Canal, Waikīkī may never have developed into the worldwide tourist attraction it is today. In 1925, the City Planning Commission requested the citizens of Honolulu to submit suitable Hawaiian names for the renaming of the Waikīkī Drainage canal; twelve names were suggested. In November 1965, a storm, classified as a 25-year event, overflowed the Ala Wai Canal banks and flooded Ala Wai Boulevard. The Ala Wai Canal is listed in the National and State registers of historic places. 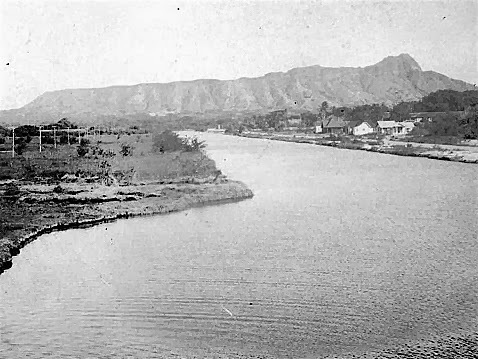 The image shows the Ala Wai Canal in about 1925. In addition, I have included more images on the Ala Wai Canal in a folder of like name in the Photos section. In traditional times, Pi‘inaio Stream was the dominant feature of the eastern area of Waikīkī. It entered the ocean as a wide, ribboned kahawai (wide delta,) bringing fresh waters from the mountain valleys and creating an area of abundance. The early-Hawaiians found this plentiful land and marine resources as an excellent place to settle (the early settlers arrived around 600 AD.). The shallow relatively-protected reefs of Waikīkī and the availability of the riparian resources of the Pi‘inaio estuary made the back dune ponds easily adaptable into fish ponds. The inland ponds may have formed along the coast where existing depressions in the sand were chosen to make the loko puʻuone, and brush was cleared out. During traditional times, the ponds were used to farm fish, usually for the Hawaiian Ali‘i (royalty). The ʻamaʻama (mullet) and the awa (milkfish) were the two types of fish traditionally raised in the ponds. Kālia was once renowned for the fragrant limu līpoa, as well as several other varieties of seaweed such as manauea, wāwaeʻiole, ʻeleʻele, kala and some kohu. Limu kala was harvested to make lei for offerings. The lei limu kala was and is still offered at the kūʻula [stone god used to attract fish] by fishermen or anyone who wishes to be favored by or is grateful to the sea. John Papa ʻĪʻī relates an account from the early-1800s of a catch at a Kālia fishpond: “so large that a great heap of fish lay spoiling upon the bank of the pond.” (The waste was disapproved of.) This abundance of fishponds may have required significant maintenance and would have provided a potentially huge source of food for distribution at chiefly discretion. The name of the area “Kālia” translated as “waited for” has a sense of “waiting”, “loitering” or “hesitating.” While the nuance is uncertain, one could imagine that the mouth of the Pi‘inaio Stream would be a logical place for travelers to pause. Kālia is also mentioned in a story about a woman who left her husband and children on Kīpahulu, Maui, to go away with a man of O‘ahu. Her husband missed her and went to see a kahuna (priest) who was skilled in hana aloha (prayer to evoke love) sorcery. In Fragments of Hawaiian History John Papa ʻĪʻī described “Honolulu trails of about 1810,” including the trail from Honolulu to Waikiki. He said that: Kawaiahaʻo which led to lower Waikiki went along Kaʻananiau, into the coconut grove at Pawaʻa, the coconut grove of Kuakuaka, then down to Piʻinaio; along the upper side of Kahanaumaikai‘s coconut grove, along the border of Kaihikapu pond, into Kawehewehe; then through the center of Helumoa of Puaʻaliʻiliʻi, down to the mouth of the Āpuakēhau Stream. Based on ʻĪʻī‘s description, the trail from Honolulu to Waikiki in 1810 coursed through the makai side of the present Fort DeRussy grounds in the vicinity of Kālia Road. It is likely that this trail was a long-established traditional route through Waikiki. Toward the beginning of the 1900s, downtown Honolulu was the destination for Hawaiian visitors, who numbered only about 3,000. While Honolulu had numerous hotels, there were few places to stay in Waikiki. In 1891, at Kālia, the ‘Old Waikiki’ opened as a bathhouse, one of the first places in Waikiki to offer rooms for overnight guests. It was later redeveloped in 1928 as the Niumalu Hotel; the site eventually became the Hilton Hawaiian Village. In 1911, the Army acquired 70-acres for the construction of Fort DeRussy and started filling in the fishponds which covered most of the Fort – pumping fill from the ocean continuously for nearly a year in order to build up an area on which permanent structures could be built. Then, as part of the government’s Waikīkī Land Reclamation project, the Waikīkī landscape was further transformed with the construction of the Ala Wai Drainage Canal – begun in 1921 and completed in 1928 – resulted in the draining and filling in of the ponds and irrigated fields of Waikīkī. Dredging for the project was performed by Hawaiian Dredging Company, owned by Walter F. Dillingham, who then sold the dredged sediments to Waikīkī developers. The dredge produced fill for the reclamation of over 600-acres of land in the Waikīkī vicinity. The image shows the ʻili of Kālia over a Google Earth image. In addition, I have added other related images in a folder of like name in the Photos section on my Facebook and Google+ pages. Lawrence McCully was born in New York City on May 28, 1831; two years later, the family moved to Oswego, New York. He attended Courtlandt Academy and graduated from Yale in 1852; he was a tutor for a family in New Orleans and later taught school In Kentucky. On December 15, 1854, King Kamehameha III died; shortly after, McCully, a young man of 23 years, arrived in the Islands with the intent of making it his home. He got a job in 1855 as “Police Justice” in Hilo. A couple years later, he resigned and moved to Kona, where he bought land and began an orange orchard. While on the Big Island, he learned the Hawaiian language. When he moved to Honolulu in 1858, he studied law in the office of Chief Justice Harris and passed the bar in 1859. In 1860, he was elected to the Hawaii Legislature as a representative of Kohala, then was picked speaker of the House. Because “the practice of law was not very remunerative in those early days,” McCully became, in 1862, an interpreter to the Supreme Court and the Police Court in Honolulu. He later became Clerk of the Supreme Court; then, he took a position as a deputy attorney general. In 1877, King Kalākaua appointed McCully as Second Associate Justice of the Supreme Court, then in 1881, to First Associate Justice and a member of the Privy Council. McCully had acquired a land grant (3098) and owned about 122 acres makai of Algaroba Street to Kalākaua Avenue. In 1900, eight years after McCully’s death, a subdivision map and a prospectus for the property was submitted to the authorities. The property, which extended from South King Street to Waikīkī Road (Kalākaua,) was to be divided into 53-blocks of equal size. 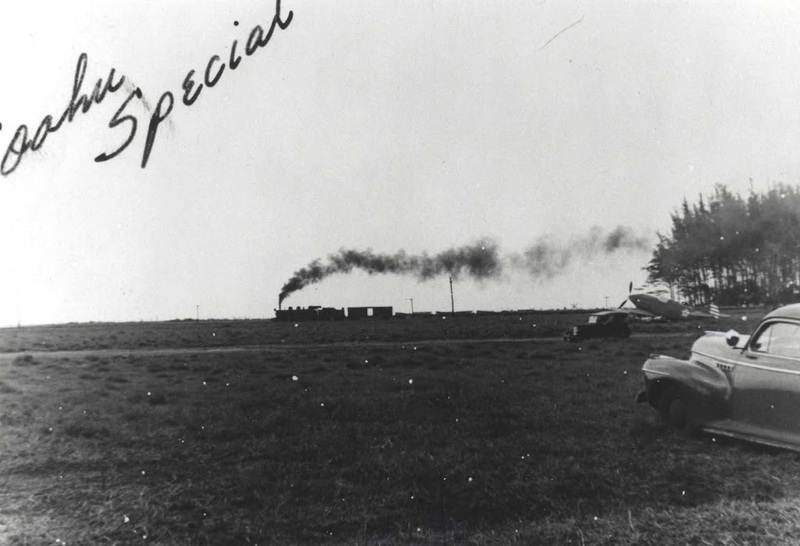 The subdivision was to be serviced from “town” by an electric streetcar line passing through the district. Lawrence McCully died at his residence on April 10, 1892. A district on Oʻahu, a major roadway (and bridge) and others are named after him.